The future’s bright for the young Angeleno And an old song plays in his head Far as he knows. . . These lines from the title track of Sam Outlaw’s debut album Angeleno could almost serve as a haiku-like artist bio. Outlaw is a southern Californian singer-songwriter steeped in the music and mythos of west coast country, absorbing the classic vibes of everything from ’60s Bakersfield honky-tonk to ’70s Laurel Canyon troubadour pop and refashioning them into a sound that’s pleasurably past, present and future tense. 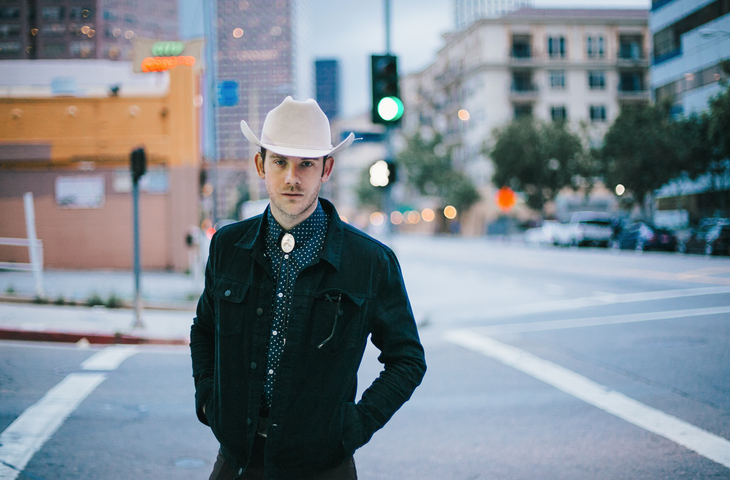 While he explores those shadows on the title track and the elegiac “Ghost Town,” Outlaw mostly comes down on the side of the optimists through Angeleno’s dozen tracks. Opener “Who Do You Think You Are?” breezes in with south of the border charm, all sunny melody wrapped in mariachi horns, while “I’m Not Jealous” is a honky-tonker with a smart twist on the you-done-me-wrong plot. “Love Her For A While” has the amiable lope of early ’70s Poco, “Old Fashioned” the immediacy of a touch on the cheek, and the future Saturday night anthem “Jesus Take The Wheel (And Drive Me To A Bar)” shows Outlaw has a sense of humor to match his cowboy poet nature. Throughout, producers Ry and Joachim Cooder frame the material with spare, tasteful arrangements, keeping the focus on Outlaw’s voice. And it’s a voice that indeed seems to conjure up California in the same way as Jackson Browne’s or Glenn Frey’s. Easy on the ears, open-hearted, always with an undertow of melancholy.